"Springalong: Images of Change, Growth & Hope"
WTMD is excited to host "Springalong: Images of Change, Growth & Hope" featuring works by Trudy Babchak, Kathy Strauss, Mattye Hamilton, Leslie F. Miller and Isabel Last. 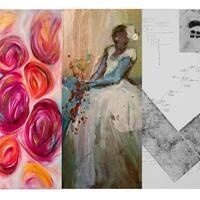 Curated by Peggy Hoffman, the art exhibit runs April 4 through May 3 at WTMD, 1 Olympic Place in Towson. The opening reception is 5:30 p.m.-8:30 p.m. Thursday April 4. Mattye Hamilton uses luscious, unexpected combinations of color, pattern, and line, infusing her work with equal measures of nature and style. Her work encompasses figures, still lives, and abstraction inspired by nature. In her work, Hamilton seeks to portray a quiet, meditative quality, encouraging the viewer to look inward. Hamilton received her BFA in painting from The Maryland Institute College of Art in 1994. Her work has been exhibited at Fleckenstein Gallery, The Creative Alliance, Hamilton Gallery, and Columbia Center for the Arts. Her works have also been published in several magazines, including Shape Magazine, MS, and Baltimore Magazine. Leslie F. Miller likes to break things and put them back together in a random, yet tasteful, order. She is a writer (Let Me Eat Cake, 2009, Simon & Schuster), photographer, and mosaic artist. Her “Headless Woman” series was sparked by her daughter’s $2 thrift-store purchase of the featured headless doll. As women are always being forced to reinvent themselves based on societal pressures and constraints, the Headless Woman—fitted with dozens of “heads”—is a symbol of rebirth and regeneration. These photos are a statement on a woman’s turbulent relationship with her own body and mind, often in conflict with societal views. Isabel Last is an artist and a student studying Spanish, secondary education, and linguistics at Towson University. Through her academic pursuits and through her artwork, Last attempts to manifest different aspects of herself. In her art one sees the products of a mind at play, with duets of abstract form and vibrant color taking center stage. Last’s work exhibits a consistent gravitation towards the visually energetic, though the pieces themselves do not stray far from being simplistic in nature. Her paintings give way for an exciting conversation between the smooth and the terrained, the saturated and the dry, and the lineated and the delineated. Kathy Strauss is an artist and a scientist. This gives her a continual urge to peer beneath the surface of things. As an artist, she works primarily with paper and fiber. The work she has chosen for this exhibit all has to do with matter or planet birth and formation. Strauss earned a degree in art from Westminster College, with a concentration in biology, as well as a concentration in Mathematics from UMUC. Her work has been exhibited at the Creative Alliance, Maryland Art Place, and the Institute for Genome Sciences, as well as in Pittsburgh, Washington DC, and New York. As a scientist, she is working with a team to eradicate malaria. Strauss lives in Linthicum.